We started as a coalition made up of a handful of groups who use our parks and greenways for exercise, transportation, relaxation and connecting with nature. It quickly grew from there. Contrary to what our critics say, we are not anti-development, anti-cars, anti-growth, anti-business, anti-housing, anti-change, anti-everything. We accept that modern cities need effective transportation systems and that we are still, for the most part, a car-centric culture. Nearly all of us own and use cars regularly. Oh, and, as has been suggested in the local media, the original PnP committee are NOT part of the No Casino Ptbo group (although we do like their “evaluate ALL the impacts not just the ones that support the City proposals” approach). Sadly, many of our critics prefer to attack us and spread falsehoods rather than debate the evidence. The reasons are many. 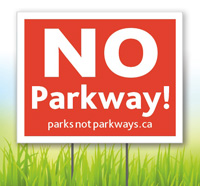 We believe the proposals made under the Parkway Corridor Municipal Class Environmental Assessment (EA) are not the best way to keep our city running. We don’t believe they will do what is suggested. We believe they are based on thinking that is outdated and has been proven time and time again not to work. We believe the process has been driven by theories from those who profit by building roads and not on real empirical evidence. We believe the costs are much too high (in oh so many ways). We don’t think the EA process has been objective, fair and open minded. We also note that the EA findings contradict those of the previous study done by the City. We believe Plan B, the Road 3-Fairbairn option represents a better choice for Peterborough. Even the city-paid consultants agree, it gives us 94% of the benefits of the Parkway option with no loss of greenspace and no bridge through Jackson Park. We think the consultants have it only half right and that North-South traffic flow is our biggest problem and that Plan B does a BETTER job at connecting growth residential areas to the Downtown and the main destinations in the southwest part of the City. Here is more on why we think Plan B is the better option. Our group includes a range of other people, all with unique perspectives on why this is all wrong and feel we are being mislead on the Parkway Proposals. We want smart, progressive progress based on evidence, not the self-serving theories promoted by the heavy construction industry. We are united in our love for this City and a desire to not see it go down the same tired, expensive and destructive paths that have proven time and time again not to work for cities across North America. We believe Peterborough, with its natural settings, educated workforce and caring citizens is uniquely positioned to find its place in the new economy. An economy that places high value on priceless city assets like greenways and parks. We want modern progress, not out-of-date thinking that evidence has shown, time and time again, does not work and profits a few.